The concept of the Sunday Cat was to have a boat with the cockpit space of our current Sun Cat Daysailer but with the convenience of an enclosed portapotty area and, if necessary, a place to get in out of the rain. There is also an abundance of storage space that is accessible through the seat locker hatches in the cockpit or inside the little cabin. The cabin is not only large enough for the porta potty and gear but there is plenty of room for a cooler. The Sunday Cat is not a sleep aboard boat but with the addition of the optional boom tent one could camp cruise by sleeping in the cockpit. 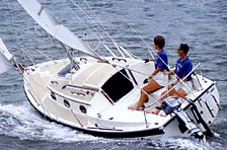 Offering new sailboats from Com-Pac Yachts, Gulf Island Sails has the perfect sailboat for you, no matter what your desires. If you're looking for strength and seaworthiness with classic lines and fine fit and finish, a Com-Pac sailboat is the boat for you. Offering sailboats from small daysailers (such as the the Com-Pac Sun Cat and the new Com-Pac Legacy) to cruising yachts such as the Com-Pac 35, Gulf Island Sails is sure to have the boat you're looking for. 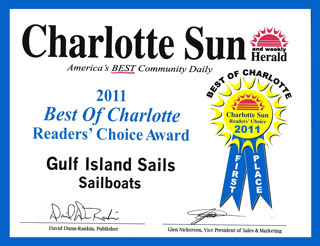 Our staff of experienced, knowledgeable sailors will provide expert advice and assistance in helping you find the right boat that will provide years of sailing enjoyment. As a Tohatsu Outboard dealer and Tohatsu/Nissan authorized service center, we can equip your new sailboat with a quiet, reliable 4-stroke outboard, and we provide maintenance and warranty work on both lines of engines. 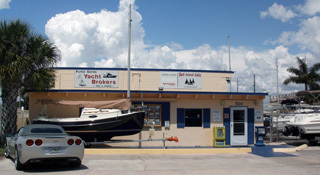 We are also Punta Gorda Yacht Brokers, a full service brokerage providing personal attention to those looking for used powerboats and used sailboats. 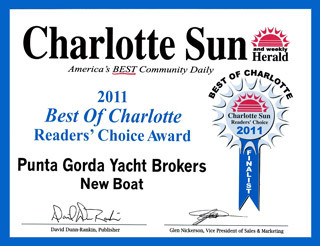 Punta Gorda Yacht Brokers handles all types of powerboats and sailboats, both new and used.